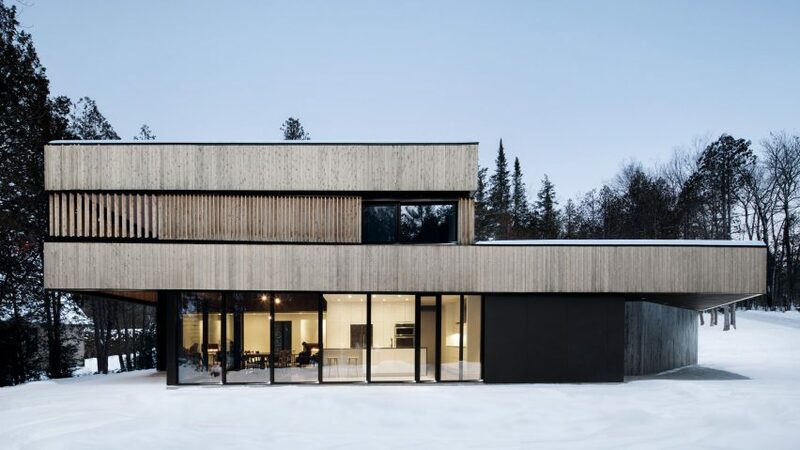 This wood-clad home in Canada was designed as a secondary residence for sisters that split their time between Montreal and the Eastern Townships, and nestles into the landscape overlooking Lake Memphremagog. Completed in 2016, the two-storey Maison sur le Lac encompasses three bedrooms. Montreal studio ACDF Architecture based its design on the surrounding landscape, which is a popular destination for nearby city dwellers. "The starting point for the architecture is that of the immediate landscape," said the firm. "Like Memphremagog's landscape, the house is built with openness as a mindset, without physical boundaries." This approach is reflected in the home's floor plan, which articulates around a double-height space that combines living, dining, and kitchen functions. 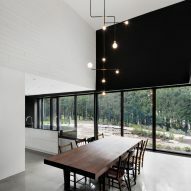 "The two clients rapidly expressed their desire for a home with an open living area, where gastronomy and good dishes are prepared in direct relation to nature and the lake," said ACDF. A covered deck is accessible from this room via floor-to-ceiling sliding glass walls. 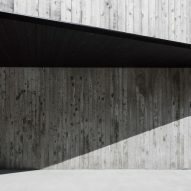 Access to the home is from the south, where a triangular roof overhang protects visitors from the elements. In addition to the social spaces, the ground floor includes two bedrooms that face east. A sculptural wooden staircase leads to the partial second storey. Here, a secondary lounge area overlooks the dinner table, and a guest bedroom enjoys privacy from the rest of the home. Construction techniques and materials were chosen to reference the area's building traditions. 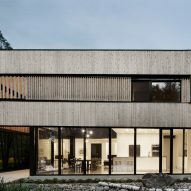 "The vernacular typology of wooden farm buildings and sustainable construction made of field stone is reinterpreted to define the modern house that is generously opened on the landscape," the architects said. Environmental concerns were an important aspect of the design. "No traditional [heating, ventilation and air conditioning] system is installed in the residence," said the architects. "Only passive principles are proposed to ensure proper ventilation and solar gain control." 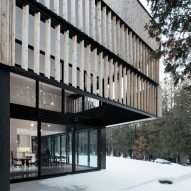 Vertical hemlock boards that cover the facade are modulated to allow maximum heat gain in the winter months, but allow for ventilation in hot weather. "The local hemlock wood is left natural and will gain a grey patina over time," ACDF said. "The house will slowly begin to blend in with the natural environment, fitting perfectly into the trees that already inhabit the site." Additionally, the polished stone floor helps to regulate the home's temperature. 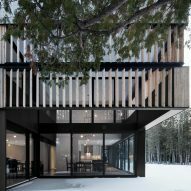 Other projects by ACDF include a monochrome family home with a dramatic cantilevered living room and an arts hub just outside of Montreal that aims to provide cultural amenities to suburbanites.